In the 1980s, S.T. Joshi prepared revised editions of H.P. Lovecraft’s stories for Arkham House. Basing his work on consultation of manuscripts, early publications, and other sources, Joshi corrected thousands of errors in the existing texts of Lovecraft’s fiction, allowing readers to appreciate the stories as Lovecraft originally wrote them. In the thirty years that have followed, Joshi has continued to do research on the textual accuracy of Lovecraft’s stories, and this comprehensive new edition is the result. For the first time, students and scholars of Lovecraft can see at a glance all the textual variants in all relevant appearances of a story—manuscript, first publication in magazines, and first book publications. 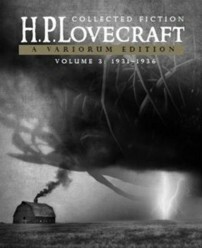 The result is an illuminating record of the textual history of the tales, along with how Lovecraft significantly revised his stories after initial publication. Along the way, Joshi has made small but significant revisions to his earlier corrected texts. He has determined, for example, that Lovecraft slightly revised some stories when a reprint of them was scheduled in Weird Tales, and he has altered some readings in light of a better understanding of Lovecraft’s customary linguistic usages. The result is the definitive text of Lovecraft’s fiction—an edition that supersedes all those that preceded it and should endure as the standard text of Lovecraft’s stories for many years. In this final volume, the tales of Lovecraft’s final years are presented. The Antarctic novella At the Mountains of Madness is perhaps Lovecraft’s most finished work, a superb fusion of weirdness and science fiction that he referred to as “cosmicism.” “The Shadow over Innsmouth” is a chilling evocation of the terrors inherent in a lonely New England backwater, while “The Thing on the Doorstep” and “The Haunter of the Dark” feature physical horrors with cosmic implications. “The Shadow out of Time” is the culmination of Lovecraft’s portrayal of the vast vistas of space and time—his signature contribution to literature. S.T. Joshi is a leading Lovecraft scholar and author of H.P. Lovecraft: The Decline of the West (1990), I Am Providence: The Life and Times of H.P. Lovecraft (2010), Lovecraft and a World in Transition (2014), and other critical and biographical works. He has also done significant research on such writers as Lord Dunsany, Ambrose Bierce, Arthur Machen, and Ramsey Campbell. Additional volumes in this set include Volume 1: 1905–1925, Volume 2: 1926–1930, and Volume 4: Revisions and Collaborations. Collected Fiction, A Variorum Edition, Volume 3: 1931–1937. By H.P. Lovecraft, Edited by S.T. Joshi. New York, NY: Hippocampus Press; 2015; ISBN 978-1-61498-111-4; 520 pages; hardcover. This book may be purchased in hardcover from Amazon.com or Barnes & Noble or directly from the publisher, Hippocampus Press.